The Acquaintance party of the Department of Advertising and Public Relations in the Polytechnic University of the Philippines had become a trendsetter when it comes to fashion. The department comes up with different themes to challenge the creativity of every Advertising and Public Relations student. 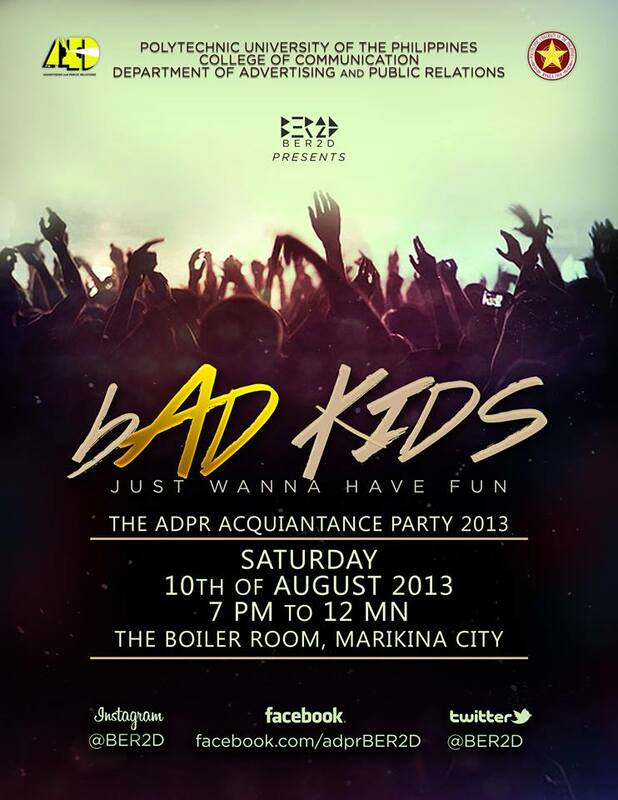 The theme for this year’s Acquaintance Party is “bAD Kids”. Well, everyone gets the chance to look bad for the night. Disclaimer: Looking bad is different from acting bad. Showing inappropriate actions during the event is strictly prohibited. 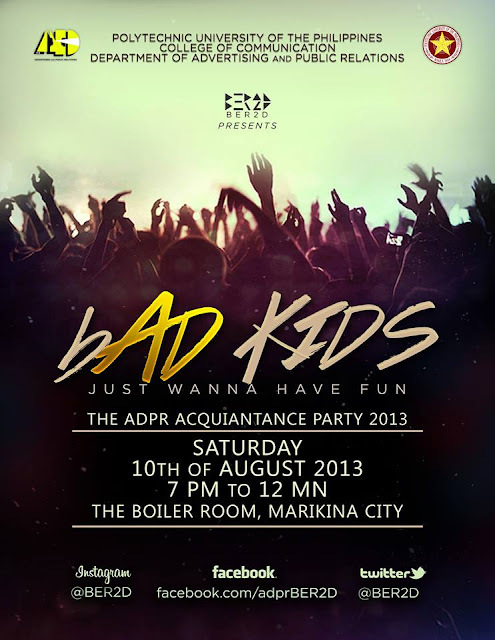 To tell you about the party’s details, it was held last August 10, 2013 at the Boiler Room located in Marikina City. Of course, I wouldn’t pass the chance to achieve that certain Bad Look. But, I have to say that I really really had a very hard shopping for clothes that would really relate to this theme. I wanted to be exceptional yet would still wanna maintain the same taste I always had. I don’t want to look gory or Gothic just by wearing the heavy eyeliner on. Another consideration I had in mind was that I would buy something that I could use for different outfits. I don’t wanna end buying something that would later get buried in my closet. So here are my picks, a unique printed black top, a white skater skirt, black stockings, and gray-black sneakers. My friends also came up with their own unique look on looking like a bad kid. We all had a comfy yet rocking outfit that night. And yes, the party was hella awesome and I’m glad I didn’t miss it.